Last month, I posted a few notes on possible displays of crimes in time. This post shows the small amount of headway I've made towards implementing the competing ideas of spherical vs. conical fields around crime events. 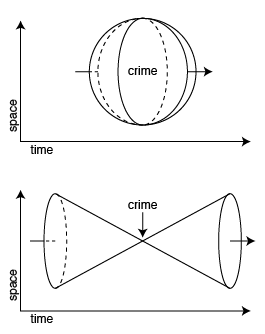 The difference between the two boils down to the shape of the three-dimensional field (two dimensions of space, one of time) that surrounds a criminal event. The sphere is centered on the event, and is largest in space when closest in time to the crime. The cone is smallest in space when closest in time, but ripples forward and back. See a larger version of this view. 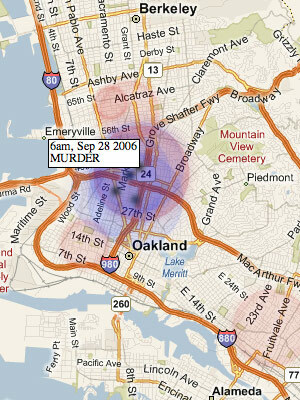 Red circles show a crime that is yet to happen, while blue circles show a crime that has already happened. The black dot in the center is visible only inside the sphere. There are two versions of this interactive piece to play with full-screen, showing murders and prostitution. The second one is interesting, because it shows that prostitution arrests in West and East Oakland (along San Pablo and International Boulevards) occur in waves. The two areas are relatively quiet for days or weeks, then suddenly get hit with a block of arrests. I'm guessing this is due to planned and coordinated OPD vice squad activity. You can see examples of such waves on February 15, January 18, December 20, and December 14.